Thanks, that is a great scene and Bilbo is such a geat character. I haven’t seen the new Hobbit yet but I rewatched the first one last week – can’t complain about the casting in that one either! Very good review. Especially on the performances. I think the two best here are Sean Astin and Sean Bean, a trend (in Astin’s case anyway) that continues through the trilogy. Thanks for the comment, yeah Sean Astin is great as Sam throughout all of the films. great review for one of the best trilogies ever!! I couldn’t get thru the books, but was amazed at the movies. I own all 3 extended edition DVD’s and every year watch the trilogy one after the other. Fellowship is my favorite of the three. Thanks for the comment, watching them altogether just shows how they flow so seamlessly. Couldn’t agree more, superb film. And I’m not a huge fantasy fan. Thanks man, it really is an achievement in film making. Thanks for this review. My other half found the LOTR trilogy in a charity shop last week and you’ve made me want to start watching! Interesting the mention of Dominic Monaghan. Recently watched him in ‘Lost’ so will be interesting to see him in this. Thanks for the comment, let me know your thoughts when you get round to watching them. 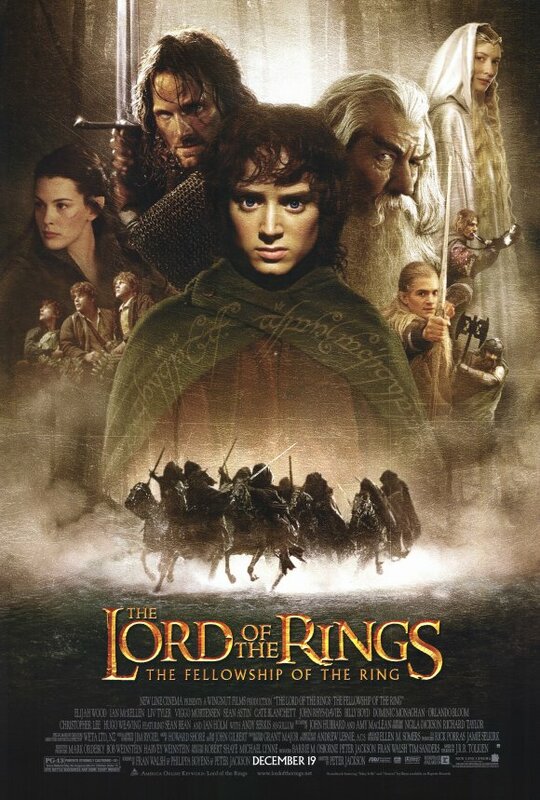 Fantasy is amongst my least favoured genres, and yet The Lord of the Rings is my all time favourite film. That’s saying something. Thanks, I know many people who don’t like fantasy but really love Lord of the Rings. Visually, this movie has a whimsical sense that you don’t often see in modern movies. Peter Jackson was brilliant to alternate between in-camera stuff (costumes, sets, camera-tricks that make characters seem big or small) and cgi (most notably, Golem). It truly was a feast for the eyes! Thanks, totally agree with what you said about Peter Jackson and the visuals, still some of the best I’ve seen in a movie. I have to give it to Jackson for spotting the ideal locations in New Zealand. The cast has a great pedigree too. But the best bit has to be the rendering of the Orcs, as they are suitably ugly and fearsome. Ultimately, I regard this as fantasy entertainment for older children. If you watched them fresh at that age, you will surely carry that love of them through to later life. But as I was 49 when this was released, I hardly fall into that category, I’m afraid. Good review though, V. Your love and passion comes over in every line. I was late to the Lord of the Rings party, I was around 15 when I first saw them, which was many years after their initial release. The visual splendour is breathtaking and burns itself into memory along with the wonderfully epic score and talented cast. That is a wonderful write up on one of my all time favourite films (and the film that got me massively into them, watched the EE hundreds of times as well as every single special feature on the discs). Your right it really is an incredible world and New Zealand is a beautiful place, I have always wanted to visit since seeing these films. In my lifetime, I hope to visit New Zealand to see were the movies were filmed. Happy I could do the movie justice. Yeah a very good friend of mine now lives in Wellington so I have excuse really! I’d head over there anytime I could. I agree with you on pretty much all fronts; these films are close to flawless and the biggest pop culture phenomena since Star Wars and The Matrix. They make much of the rest of the fantasy genre hard to watch, by comparison. My comments on your review itself are as follows: I like you’re intro, your ending summary, and your succinct description of the epic story. However, the body paragraphs had a lot of run-on sentences, which made some of the reading difficult. Also, the “film title” section is redundant since the post title is already at the top of the page. Additionally, I appreciate how you listed the entire main cast *and* their roles. I really appreciate your constructive feedback. This is an older review of mine and since my reviewing style has changed quite a bit. A great review and, as you said, no number of positive adjectives could do these films justice. The whole part in Moria is just epic beyond words! I’d need a thesaurus to keep adding some descriptive words to how immersive these movies are. Thank you for recommending this review. Love the detail and the reasons in supporting your opinion. Great usage of adjectives that fit the characters we see onscreen. Looking back at this ensemble, I probably didn’t appreciate as much as I do now. I mean what an incredible cast, and the cinematography is gorgeous. It serves as a standard for future fantasy films (i.e Warcraft). Also lets not forget the score. My favorite is the one played during the scenes in The Shire. Great review! The cast is so well assembled and are all given their moment in the sun. It was a huge coup getting such a wonderful cast to essay these roles. And you should give my takes on the other two entries of the trilogy. I definitely plan on doing so. Looking forward to it. You can find them in my review index. I’ll get around to reading the other two film write-ups, but this is my favourite entry and one I’ve watched many, many times over the years. Everything works in it for me, largely because of the heavy use of real locations and the complete immersion of the actors into their characters. The ‘Making of’ material reflects the investment everyone made, hard work to get it all just right, down to real swords being crafted for the actors to make them feel like, well, like real swords. The real standout for me is Mortensen, and that’s within a brilliant cast. All the pain and effort his character makes is there on the screen, all that matted hair and dirt, as though he’s going through ringer in the same way Aragorn does. A magnetic performance. Just a really great film, a game changer for the industry in many ways, and I think you’ve got that across in your excellent piece. Everyone who took part put their heart and soul into it in every are imaginable. It was an ambitious project but it came off beautifully and majestically. I can’t wait for you to read my other reviews from the trilogy. This comment has just made my day, thank you. I find that my structuring has changed a bit but still follows something of the same format in my other reviews. I can’t help but wax lyrical about these movies, there’s so much to talk about. Pippin into two buffoons just for comic-relief, while in the book they show some smarts and grew into real heros. It is one hell of a cast. I do think that Merry and Pippin mature in the second movie a lot. Nitpick as much as you want Marta. Hope you’re having a lovely Christmas. Kidding…it’s been a nice day. Hope your Christmas is going well too. I’m stuffed too, my day has been great so far. Oh that sounds simply lovely and cosy Marta. I’ve just finished watching Roman Holiday, what a lovely movie. That’s a really nice film! Perfect for relaxing time. Certainly is, it was my first time viewing it and it was enchanting. Good stuff, Vinnie. This certainly does transport us to a magical, fantasy land. I did have some issues with how twee it felt in the beginning but when you gauge it over the course of the three films, this tweeness is actually quite important to capture the innocence of the hobbits. Fine work, sir! Thanks Mark, everything is so immersive here and filled with magic. I get what you mean about the tweeness in the beginning but as you said it emphasizes the naive lives of Frodo and co in The Shire that eventually gives way to graver realizations. You’re right that this movie is sonically epic. I’m glad you pointed that out in this mighty review. Thank you for describing my review as mighty. I did my best to correspond with the majesty of the film. One reason I haven’t reviewed this is, what can I possibly add to the conversation? Your review felt original to me. Thank you, I do try and capture the essence of the movies in my reviews. So for you to say that my review felt original, really made my day.